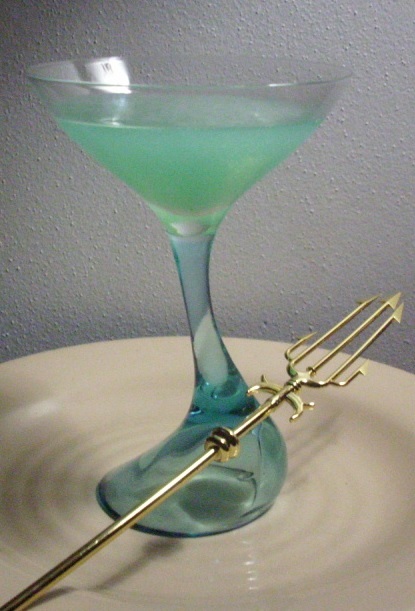 Celebrate a bon voyage, especially one by sea, with this Friday cocktail, Poseidon. Think not of the movie misadventure, but rather of the god of the wine, dark sea. Poseidon and his brothers, Zeus and Hades, drew lots after the defeat of the Titans, and Poseidon was given dominion over the oceans. With a wave of his trident he could cause earthquakes or stormy seas. One of the twelve Olympian gods, he was the patron of sailors and horses and was later equated with the Roman god, Neptune. As of May 2015, this particular drink has been on offer at Limani, a restaurant serving up Mediterranean cuisine in New York City. I know the ingredients for the drink, but not the proportions, other than using “a drop of the original blue curaçao.” Ideally, I think the intention is to use enough blue Curaçao to approximate the color of the Aegean Sea. Ouzo, an anise-flavored aperitif popular in Greece, is the main, featured ingredient in this cocktail. The entire concept has inspired me to seek out (or create) a cocktail for each of the Olympian gods. For the simple syrup, put one part sugar to one part water (say a cup of each) in a sauce pan and bring to a boil. Let cool. Pour an ounce of ouzo, 1/2 ounce of simple syrup, and 2 ounces of lemon juice (fresh if possible) into a shaker with cracked ice. Add a dash of blue Curaçao. Shake and then strain into your cocktail glass. No garnish is called for, but a twist of lemon peel could be used. How I like it: The blue-green color of the pictured drink was achieved by using a teaspoon of Blue Curaçao. Instead of simple syrup, I used honey syrup. Bring about a 1/2 cup of water to a boil. Once it comes to a boil, remove from heat and add in a generous tablespoon of honey. Stir until the honey dissolves into the water, creating your honey syrup. You may have to adjust the proportions of simple (or honey) syrup and lemon juice to suit your taste. More syrup and less lemon juice is ideal. Εις υγείαν! στην υγειά σου! To your health and responsible drinking.